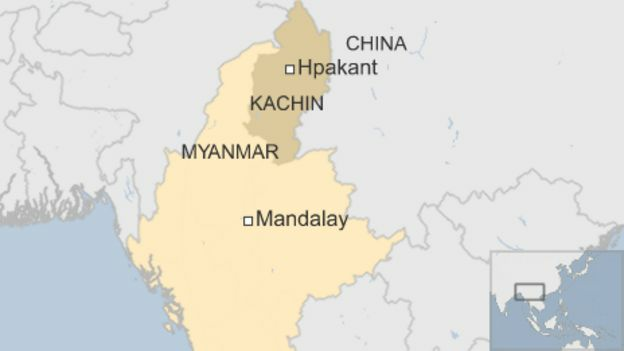 Rescue efforts are underway in Myanmar’s jade-producing area after a landslide killed at least 12 people with fears that there may be as many as 100 others buried under the rubble, local officials have told the BBC. The disaster happened at Hpakant, a town in the northern state of Kachin. Billions of dollars of jade are mined in Hpakant each year. Most of it is for the lucrative Chinese market. However, the industry is unregulated and landslides are common. Dozens of people were killed by a landslide in the Hpakant area in December and in November more than 100 were killed. Jade mining produces piles of waste rock. Itinerant workers climb the heaps to search for the gem stones left behind by large-scale industrial mining firms. 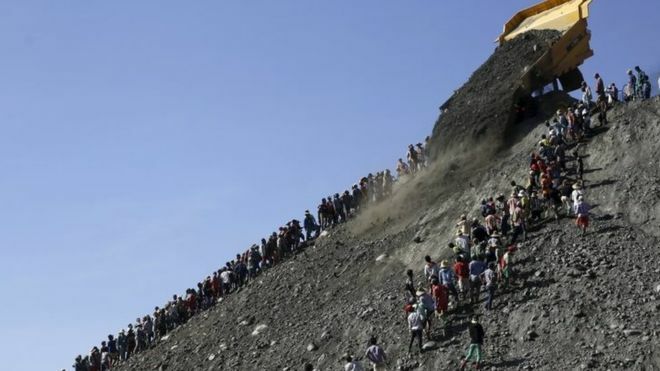 The BBC’s Jonah Fisher in Myanmar says that the exact circumstances of the latest landslide are still emerging – but it is another reminder of just how dangerous the country’s jade mines are. Local police have told the AFP news agency that the rescue effort is continuing. However, it has been hampered by heavy rainfall and poor transport and communication links to the affected area. Local residents and aid workers say that hundreds of people were searching the deep pits abandoned by the mining firms during Myanmar’s rainy season, when most big companies stop operations. “We think about 200 people were working in that area when the landslide occurred [on Monday] night… There could be many more casualties,” a local resident told AFP. Myanmar – also known as Burma – is the source of nearly all of the world’s finest jadeite, a near-translucent green stone known in neighbouring China as the “stone of heaven”. In a report in October, advocacy group Global Witness said the value of jade produced in 2014 alone was $31bn (£21n) – the equivalent of nearly half of Myanmar’s GDP – yet hardly any of the money was reaching ordinary people or state coffers.